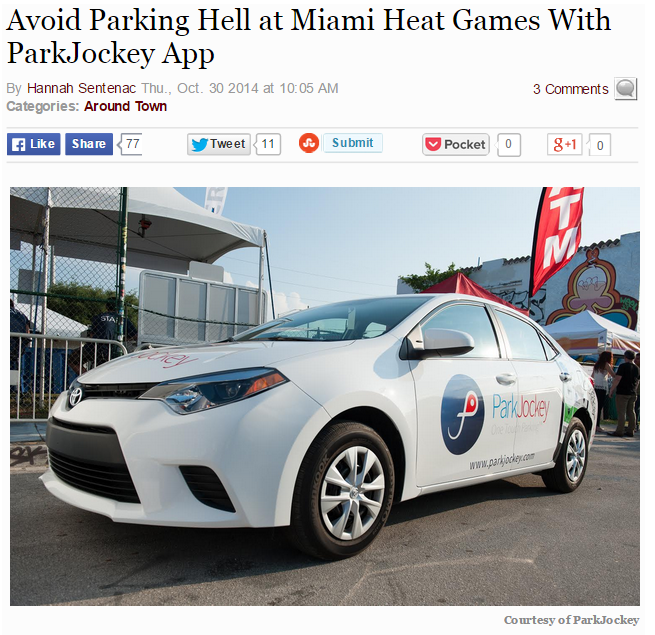 ParkJockey Miami is proud to be featured in the Culture section of The Miami New Times as the official parking partner of the Miami HEAT. The home opener for Miami was last Tuesday, October 30th, 2014, and marked a great start for this year’s NBA season. ParkJockey Miami has already begun to reduce the stress of parking for the HeatNation and proud to be a partner of the Miami HEAT! Scott Rosen, General Manager for Miami, was interviewed by Miami New Times to give more insight into ParkJockey’s presence in the city, “We probably have about 100 locations with access to 15,000 spaces. We have lots from as far south as Coconut Grove to as far north as Port Canaveral”. Scott continued, “it’s very simple — you open up the app or website and search. We have location and event-based search. So you could search for American Airlines Arena or Wynwood or III Points, then the app will pull up the closest locations in the area at the best rates. It’s one touch parking”. Read the full Miami New Times article here. This entry was posted in Miami, News, ParkJockey, Press and tagged Basketball, Brickell, Downtown Miami, Driving, Miami, Miami Beach, Miami Heat, Miami Heat Nation, Miami Heat Parking, Miami Herald, Miami Parking, mobile app, parking, Parking app, parkjockey, South Beach, Wynwood on November 5, 2014 by ParkJockey Team.